Lighting Design has no limits with the Martin Mac 500. The MAC 500 is a reliable and award-winning profile spot luminaire, which projects a bright beam with a razor-sharp hard-edge. • PAN/TILT range of 440°/306°. 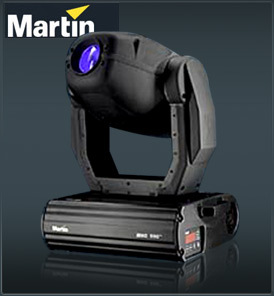 The Martin Mac 500 offers an impressive array of lighting effects and is used wherever sharp-edged profile projection is needed. Specified the world over in a variety of applications, the Martin Mac 500 has an unmatched performance and specification. The head of the Martin Mac 500 features 440° horizontal pan and 306° of vertical tilt, while self-adjusting motor belts ensure smooth and quick adjustments. Achromatic lenses provide hard-edged 17° and 23.5° beam angles. A unique bayonet mounting system makes beam angle changes a breeze. A combined microstep-driven, full range dimmer/shutter provides fluid, linear or simulated tungsten dimming curves and can strobe up to 23 Hz. A motorized iris, rotating 3 facet, bi-directional prism and motorized focus can be incorporated to enhance beam effects. Motorized focus of the optical bank allows for very sharp and clear projection. Smooth crossfades are possible, as well as immediate changes in projection length. Focus is from 2 meters to infinity. [read more...] The Martin Mac 500 is service friendly, incorporating convenient ½ turn screws making for easy component accessibility and simple lamp adjustments. In addition, rigging of the fixture has been made easy and safe through dedicated anchoring points, a safety wire attachment, quarter-turn fastening system and a mid-pan-range locator.